Two Very Interesting Weather Related Stories: (Reproduced from Earthweek). Unusually early and heavy snowfall over Beijing attributed to China’s ongoing weather modification projects has caused Beijing residents to question whether it’s right to mess with mother nature. The earliest snowfall to blanket Beijing in 22 years fell on November 1. It was followed 10 days later by another period of frozen precipitation, accompanied by freak thunder and lightning. Artificial methods have been used for several years to mitigate drought effects across North China. They were also recently used to prevent rainfall during the 60th anniversary celebrations of the Communist revolution. But such heavy and frequent snow so early in winter has snarled traffic and forced the capital's international airport to halt operations. The resulting inconvenience has triggered complaints from the public, according to the newspaper. Xiao Gang, a professor in the Institute of Atmospheric Physics at the Chinese Academy of Sciences, told the paper: "We should not depend too much on artificial measures to get rain or snow, because there are too many uncertainties up in the sky." 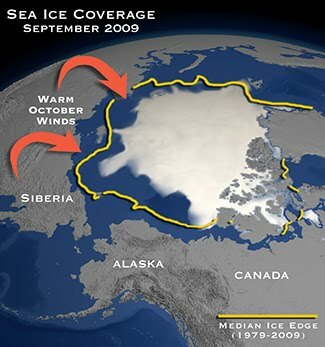 Warm Siberian winds caused October 2009 to have the second-lowest ice extent for the month over the 1979 to 2009 period. Warm southerly winds during October warmed the Arctic so much that they prevented sea ice from reforming at a rate typical of the previous 30 years. The U.S. National Snow and Ice Data Center reports that October had the second-lowest ice extent for the month over the period from 1979 to 2009. The formation of polar ice normally accelerates during that month as the sun sinks lower in the southern sky each day and the day-long nights of winter return above the Arctic Circle. But the growth rate slowed for a while early in the month as strong winds from the south blew over central Siberia, preventing the ice from forming along the coast there. By month’s end, expansive areas of open water regions still existed in the northernmost North Atlantic and north of Alaska.